Ever wonder what simple things you can do to update one of the spaces in your home? As a big “D” wading through the mud of a fabulous and inspiring new economy, I am approached with this question pretty much everyday. How can I get an incredible new look, on a shoestring budget? She has wonderful built-in bookshelves, like the ones shown below, but many of her pieces were dated and did not suit her lifestyle or personality. Her board was fun, imaginative, and spicy. And if you knew her, you would see that this board suited her perfectly. Karen is a free thinking, singer song writing rock and roll junkie, with twigs in her jet black hair, and in my book a modern day Jean Harlow hippie. Freaking awesome! Her jumping off point was this Valentino photo above. This photo encompasses everything she loves. In her words to describe it: High Fashion, Titillating couture, Old world, Valentino red, Style, Sophistication, Chic chic, Glamour, and relaxed luxury. One of the most exciting things about her space is the wall to ceiling bookshelves. It adds an unexpected focal point, that is dramatic and eye catching. Libraries are essentially a collection of books that add sophistication, refinement, and exude culture and experience, just like Valentino. 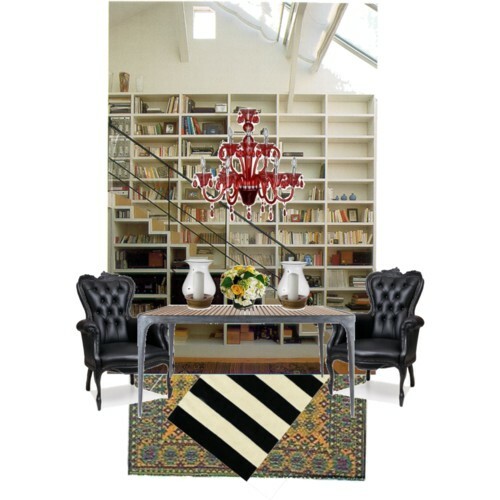 So we combined her library and dining area into one large space so the table could double for a book research surface, and a fabulous dining experience. So what are 5 super simple things you can do to update your dining room? Go Big or Go Home. Buy hurricanes that make a statement, and add tremendous weight to your table! of depth and texture, and bring in some much needed color and style. 5) Fresh flowers. I cannot say enough about fresh flowers. Your home is your haven, make it inviting. any one of your favorite flowers on the table.